Connor McGregor: Vladimir Putin "One Of The Greatest Leaders Of Our Time"
This man is one of the greatest leaders of our time and I was honored to attend such a landmark event alongside him. Today was an honor for me Mr. Putin. Thank you and congratulations on an amazing World Cup. Россия вперёд"
McGregor's social media post was met with controversy from the left who accused him of not knowing "the definition of the world leader." The Twitter user replied to McGregor's post saying, "You may be my favorite fighter of all time but no, man, Putin is not a great leader. Unless you consider leading by fear and murder is considered great. Then yeah I guess he's great at murder." 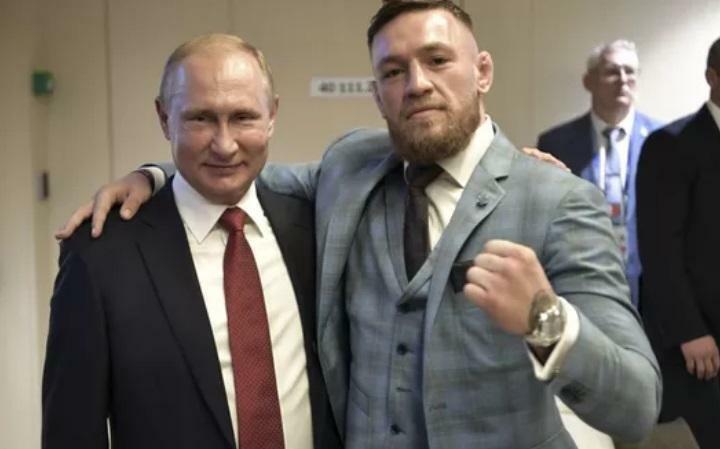 The photo with President Putin was the second to be shared by McGregor during his visit to the World Cup in Russia. His previous Instagram post from the World Cup final where France bested Croatia 4-2 said the event was "a truly amazing spectacle." McGregor is a professional mixed-martial arts fighter from Ireland and rose to fame during his career in the UFC which ultimately culminated into a fight against boxing champion Floyd Mayweather. He occasionally posts political commentary on his social media accounts fueling speculation that the champion fighter could enter the Irish political scene. Leftist scum are angry at Putin for stopping their war-fun in the Mid-East for, Israel. this is why they refuse to condemn evil Bush for 9/11. 9/11 was the cornerstone of their globalist agenda.